Yard sale season is in full swing! Here are a few tips to make yours a success. -Set a goal. Planning and executing a successful yard sale is a lot of work, and as with any big job, setting a goal at the outset is key. Are you primarily interested in reducing clutter? Augmenting your summer fun budget? Supporting a charity? Identify your main reason and plan actions in support of that goal. -Collaborate. 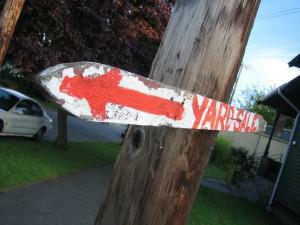 Does your community or church host a yard sale you can participate in? Might your friends, family, or neighbors like to have their own sales alongside yours? The variety at multi-family yard sales is a great draw. -Pick your date(s). Decide how many days your sale will last and set your hours. Try not to set a date that conflicts with other big community events, and steer away from major holidays – if you’d rather be grilling hamburgers with your family, then that’s what your customers will be doing. -Pricing. Decide on a pricing strategy. Lower prices will tend to move products more quickly, but for the big-ticket items, remember that people tend to perceive odd-numbered prices as a bargain, whereas even-numbered prices give the impression of quality. A well-used item that seems like a steal at $99 might not sell at all at $100! You also want to consider what each sale item is worth as a charitable deduction. Taking inventory during the pricing stage adds an extra step to the planning, but it also helps you make informed decisions as some items will be worth more as donations. Chose your charity in advance and use their donation guide to put a ghost number on each item in case it doesn’t sell. -Tools of the trade. The main thing to have on hand: plenty of change. You may lose a sale if you can’t break a twenty. Don’t wait until the day of your sale to gather other things you’ll need: tables and racks to display the goods, price tags, a cash box, and a calculator. Try getting creative before purchasing anything, especially if you’re trying to raise cash. (On the other hand, be careful how much weight you hang on the garage door tracks!) Optionally, you may want to think about a comfy chair and a box fan. Standing in the heat makes for a long day. -Product placement. Sure, it’s stuff you’d rather not look at ever again, but that doesn’t mean you can’t arrange it in an attractive way. Group practical items by function, and display complementary items together, just like retail stores often do. -Negotiating – or not. Remember that some folks love to haggle. If you’re not willing to reduce your price on a particular item, write “firm” on the price tag, but it’s best to go in expecting and even welcoming bargain-hunters. -Post-sale clean up. You won’t sell everything. If you want a second shot at turning your old possessions into cash, local consignment or selling online could be viable options. Try checking Facebook for a virtual yard sale group in your area. However, if your primary goal is decluttering, box up the leftovers for charity, using the ghost number from the pricing step to itemize your donation receipt. Got any great yard sale planning tips? Leave them in the comments!